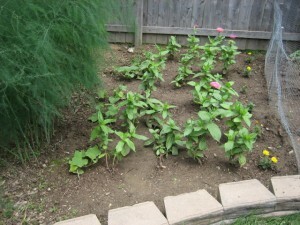 Hello, and welcome to the 2011 edition of my garden! This year is an experiment of sorts – I saved seeds from last year’s crop and grew most of the plants for this year’s garden from those seeds. 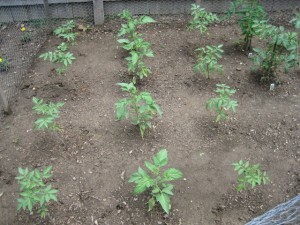 Started from seed were butternut squash, jalapeno peppers, cherokee purple, yellow brandywine and pineapple tomatoes. I also purchased some basil and Swiss chard seeds. Additionally, I bought a couple of tomato plants that I had no seeds for (green zebra and black krim) and a habanero pepper plant. 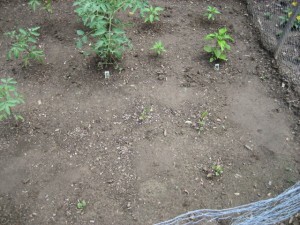 The seeds grew into nice little plants which were transplanted into the garden on June 1st. The flowers were planted on June 2nd. 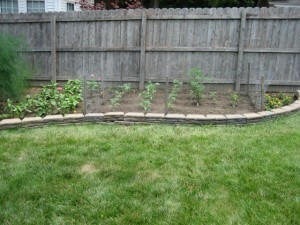 As you will see in the photos, I rotated the location of the plants this year to improve growth and yield. 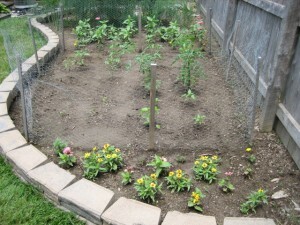 The zinnias and marigolds that were planted this year are also in new locations. 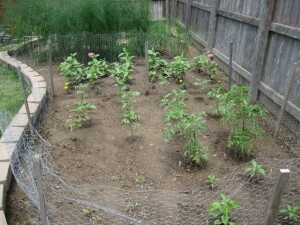 This year’s garden is truly a labor of love as you will understand after a brief explanation. On May 23rd I was out for a bike ride in Forest Park (this was the day after the tornado that hit Joplin, MO). About halfway through my ride a fast moving thunderstorm was approaching. It began to rain and the winds started kicking up so I decided it would be best to seek shelter to wait out the storm. As I was heading to the shelter a branch fell out of a tree, hit my handlebars and knocked me off the bike. I took a pretty hard fall on my left side which resulted in some cuts and bruises, a few cracked ribs and a separated shoulder. The pain has been severe at times. 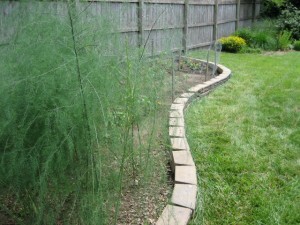 Despite my injuries, I was determined to get my garden planted before the weather became too hot here in St. Louis. I pushed through the pain and got the job done. It took at least twice as long to get everything planted but I’m so glad that I persevered. I’m hoping the rewards from this garden will be extra sweet!! The herb garden has a new look as well. 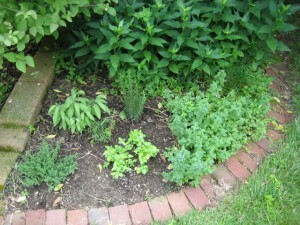 My sage, tarragon and thyme didn’t survive the winter so I replaced them w/ new plants. As usual I put in rosemary and basil (that I started from seed). So far everything is looking pretty good! All total I have 4 pineapple tomato plants, 4 cherokee purple tomatoes, 4 yellow brandywine tomatoes, 1 green zebra tomato, 1 black krim tomato, 3 jalapeno pepper plants (one plant was snapped during a strong rain storm), 1 habanero pepper, 6 Swiss chard plants (2 plants are struggling and probably won’t survive), and 5 butternut squash plants. I had extra plants that were adopted by grateful friends. 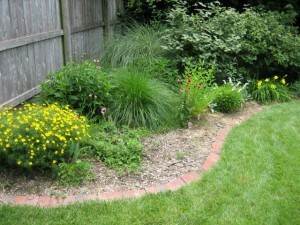 Last fall I planted several new additions in the wildflower garden to attract more bees, butterflies and hummingbirds. New to the garden are a red coneflower, anise hyssop, gooseneck loosestrife and a butterfly bush. Transplant plants into larger pots and plant stems deeper for stronger, less leggy plants. Provide nutrients at this time as well. Start Swiss chard seeds in separate pots to improve survival rate and simplifly transplantation. I am jealous that you have asparagus, and several tomato varieties that I’d love to try. Hang in there; you will have little baby vegetables soon! I’m looking forward to making a caprese salad w/ fresh tomatoes and basil from my garden. Next up… making fresh mozzarella!